When it comes to weddings, you can’t get more different than planning the bachelor party vs. planning the bachelorette party. The bachelor party job has a fun, celebratory tone to it. The bachelorette party job… whoa, there’s a lot of pressure there. Most of the time, the maid of honor will take on the responsibility of planning the bacheorette party. But since they’re also saddled with planning the bridal shower, it’s common to outsource this job to a bridesmaid. Most bridesmaids avoid this job at all costs. Which is a shame, because that’s the exact opposite of what they should be doing. 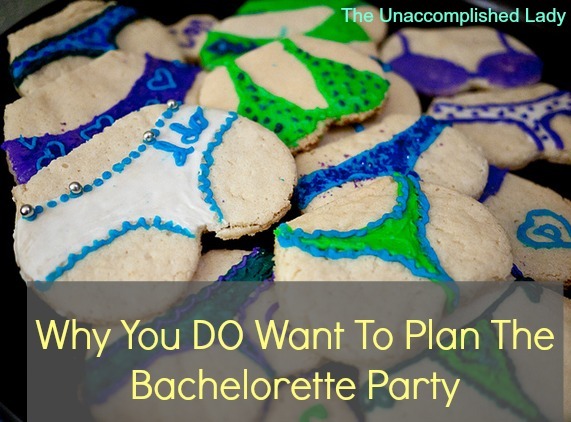 Planning the bachelorette party is one of the funnest tasks one can have in the process of putting together a wedding. It’s a chance to have the best non-ceremony-bound time possible with the bridal party. It’s one of the least public parts of a wedding! There will be no family members, no romantic partners and no wedding tasks. There’s also no pressure to perform at a bachelorette party. Every single part of a wedding is rigidly controlled by tradition. You’re expected to be elegant and charming, and to do nothing that would make your 90-year-old grandmother blush. All of that goes out the window with a bachelorette party. Unless you’re going for a certain kind of theme, you won’t have to call a catering company. You don’t have to wear anything special. You don’t even have to have booze if you don’t want. A bachelorette party also allows room for everyone to add their own tastes to the wedding process. It’s best to adhere to anything the bride explicitly wants, but other than that, it’s pretty much up to you. You get to research where to go to dinner. You get to interview those yummy strippers. If you want all the party favors to be purple, you can make it happen! It’s one of the few opportunities a non-bride can make something take place. Which, by the by, can help ease a lot of stress in the latter stages of planning a wedding. Sure, planning a bachelorette party takes time. But it’s a great opportunity to have fun with the bridal party and actually get to control part of what goes down during this entire wedding thing. It’s one of the best jobs of the whole wedding. Plus when it’s over, you’ll be the bridesmaid who planned the bachelorette party. That is a highly enviable position in the wedding world, friends. Who planned the bachelorette party at your wedding? Would you ever do it for a friend? Tell us your bachelorette party stories in the comments.